The original Bikini Factory opened on Chapala Street in downtown Santa Barbara in 1965, and has been a part of the Santa Barbara scene for 45 years (they're now located in Summerland). 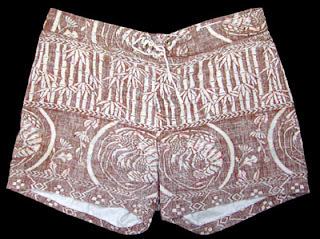 This pair was donated by Sally Yater, Renny's wife and creator of the Bikini Factory. We thought it would be appropriate to throw some props her way, since Renny's going to be getting all the attention this weekend up at Sacred Craft.